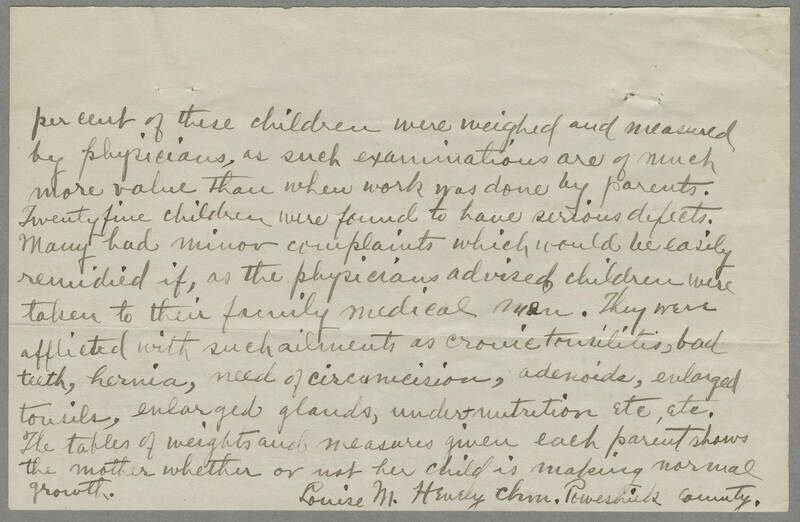 percent of these children were weighed and measured by physicians, as such examinations are of much more value than when work was done by parents. Twenty five children were found to have serious defects. Many had minor complaints which would be easily remedied if, as the physicians advised, children were taken to their family medical man. They were afflicted with such ailments as cronic tonsilitis, bad teeth, hernia, need of circumcision, adenoids, enlarged tonsils, enlarged gland, under-nutrition etc., etc. The tables of weights and measurements given each parent shows the mother whether of not her child is making normal growth. Louise M. Hevely Chm. Poweshiek County.